Tuesday afternoon, students were invited to attend a panel discussion on the future of solar power. Experts in research, technology, and distribution shared their perspectives and answered questions from inquisitive participants. Close to seventy students, faculty, staff, and community members listened intently while Dr. Randall Ellingson from The University of Toledo shared his views on the current advancements and challenges in solar energy research. Nicholas Strevel from First Solar offered his insights on the costs and benefits of utilizing solar energy as a key player in alternative energy sources, and Joseph Karrasch of American Electric Power discussed the future of utilities and the efforts being made to diversify to a more sustainable energy portfolio while ensuring long-term, reliable service. Chad Stephenson, ND Energy Postdoctoral Fellow in the Department of Electrical Engineering, served as moderator. Mid-week, over sixty participants attended a detailed discussion by Senior Director Paul Kempf of Notre Dame’s Utilities and Maintenance Department on the current and future initiatives by the University to be coal free by 2020. Kempf reviewed the various ways in which Notre Dame will utilize alternative energy sources and focus on energy efficiencies across campus. Three different tours offered during the week were near capacity: Notre Dame’s power plant, the solar array on top of Stinson-Remick Hall, and the Green Garden on top of The Morris Inn. Graduate student Steven Kobosko from the Department of Chemical and Biomolecular Engineering introduced the solar panels and Research Assistant Professor Ashish Sharma from the Department of Civil & Environmental Engineering & Earth Sciences spoke about his green roof research in Chicago prior to the tour at the Morris Inn. The staff at the power plant stepped up to provide tours, as they often do for interested groups. Over 100 participants saw first-hand how Notre Dame is working on conserving energy and reducing greenhouse gas emissions. 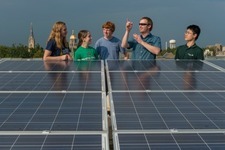 Energy Week is an annual event sponsored by ND Energy and its Student Energy Board. Week-long events are designed to create awareness and educate students on critical energy-related issues and topics. For more information about Energy Week, contact Anne Berges Pillai, Education and Outreach Associate Program Director, at apillai@nd.eu or 574-631-9106.